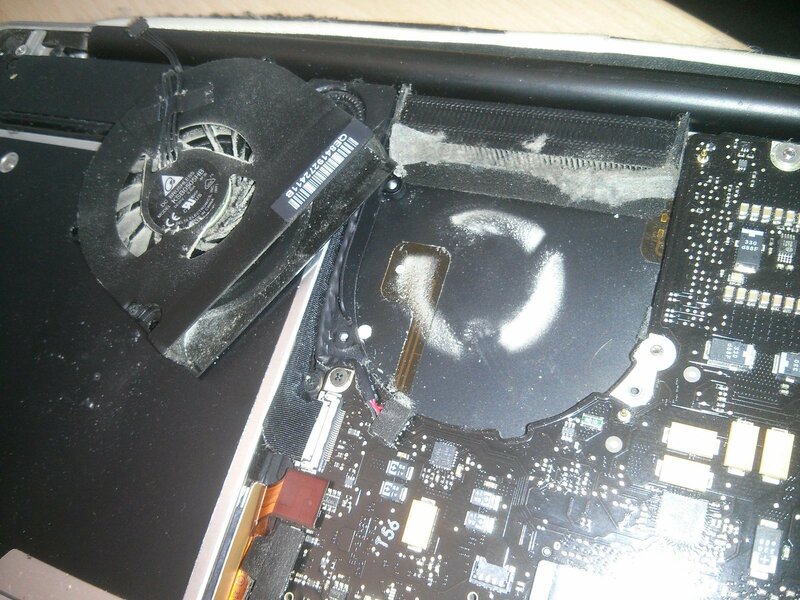 As you can see the fan´s airflow has sucked in dust particles and pressed them into the fine ribs of the heatsink. There is also significant dust deposition on the fan blades and on the underside outlet of it. Why do I show you how dirty a laptop can get inside?! Active cooling gets louder: The fan has to turn faster to get the same amount of heat out of the laptop. Less-efficient cooling causes hardware to overheat and age faster. Some specific hardware failures like the notorious NVidia or ATI Radeon GPU bugs are mostly induced by broken BGA solder joints due to thermic flexing. Check your hardware´s integrity from time to time. Keeping an eye - or better ear - on your fan(s) can save your nerves and your money. If your trusty Macbook (or Thinkpad or whatever) has been a roaring moose recently, do not be afraid of opening it. Consult the internet for specific howtos for your device. The whole thing can be educational as well (repair is good, limited resources / limited growth on earth - you already know...hopefully...really). So don´t hesitate to place your kids right next to you when you become a "dust fighter". Finally, always disconnect the fan cables before blowing out dust and hold the fan blades while doing it (you can damage the fan bearing if you give it a "supershot" with your air compressor).